2009 Update: The Trapp villa is NOT getting turned into a hotel - because locals have resisted the enterprise due to the fear of increased bus traffic. Bastards. It is run as a B&B, though. The picture above is the Fronburg, which featured in the movie, but is not the real villa. When the movie "The Sound of Music" was shot in and around Salzburg in 1965, the villa of the Trapp family was "created" from several palatial buildings in Salzburg: The Frohnburg provided its front facade, Schloss Leopoldskron Palace some lakeside scenery and the palace of Wasserschloss Anif some pseudo-medieval views. None of the three buildings is open to the general public: Schloss Leopoldskron is used by the US organisation "Salzburg Global Seminar" as a campus; Schloss Frohnburg Palace can be visited and seen from outside, but serves as a dormitroy and rehearsal venue for the Mozarteum Art University; and the Wasserschloss Anif is the private property of the Counts of Moy. Similiarly, the "real" Trapp Villa in the posh area of Aigen was beyond reach for "The Sound of Music"-savy crowds. This was due to be changed in summer 2008, when the "Sound of Music Villa" - despite of not featuring in the movie at all - was announced to be transformed into a small hotel and wedding venue. Not the first sudden move in the turbulent history of the villa. These plans were withdrawn only a few months later due to protests of local residents who feared the crowds of tourists. Originally, the villa in one of Salzburg′s most exclusive neighbourhoods was called "Villa Walburga" and designed by the legendary Salzburg architect Valentin Ceconi in 1863. It was built for Walburga Weinwurm and named after her; twenty years later, in 1883, the villa was refurbished for the states- and noblemen Raimund Hugo Count of Lamberg, again under the guidance of Ceconi. 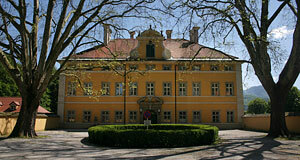 Following that, the villa was re-named into "Villa Lamberg". Baron Georg Ludwig von Trapp, he of "The Sound of Music", was a grandson of the Count of Lamberg. He inherited the villa in 1923 and had it adapted again in 1924. The property comprises of the main manor and a farmhouse and became the stage for the romance between the Baron von Trapp and Maria Kutschera, who became later famous as "Fräulein Maria" in "The Sound of Music". After the family had emigrated to the US in 1938, the building was confiscated by the Nazis. The head of the SS Heinrich Himmler used the building for his personal needs, transformed the villa′s chapel into a bar and party room and had swastikas carved into the furniture. As a luxury building, the villa was used for receptions and accommodating Nazi celebrities and even the Italian fascist leader Benito Mussolini stayed in the Trapp Villa once. In 1953, after the villa had been returned to the Trapp family, they sold the building to a monastic order called "Kongregation der Missionare vom Kostbaren Blut". In 2008, the missionaries announced that they were going to rent the Trapp villa to two hotel managers who in turn would make the building a luxury restaurant. The contract runs at first for a bit more than 12 years. As of July 2008, visitors can rent 14 rooms with a total of 26 beds. Two of the rooms are suites with more than 60 square metres; the chapel can be used for weddings, and the managers of the Trapp Villa Hotel will try to market the facilities as a wedding venue especially for American and Asian tourists. The "Trapp Family Lodge" in the US state of Vermont, by the way, is a hotel, too.